Arthritis can be a painful degenerative condition affecting the knees, hips, and spinal joints as well as other areas of the body. It is progressive, going through stages of degeneration in the majority of individuals. Those who have had an injury, such as an ACL tear, may experience arthritis progressing more quickly in the area of the injury. A common treatment for arthritis is a cortisone injection, however, this treatment generally fails to address the underlying reasons the degeneration is occurring. There is now ample support in medical literature to show biologic regenerative agents have a positive effect on both the symptoms and rate of degeneration in arthritis. The most common agents used in regenerative treatment for arthritis include Platelet-Rich Plasma Therapy, Bone Marrow Cellular Concentrate, and Adipose Cellular Concentrate. On average, a patient seeking treatment for arthritis will receive 1-3 injections over a six to twelve month period. 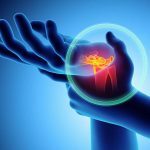 This will provide relief for one or more years depending on the severity of arthritis at the beginning of treatment and the type of regenerative treatment used.